Over the past week, there have been several teasing comments from Suggs, who mentioned the band have been working on new material. Thommo, during an appearance at The Big One Festival, has added fuel to this already roasting fire by confirming that April has been suggested as the release month for a BRAND NEW ALBUM. There have also been mentions of both McPherson and Thompson penned tracks. “Culture Vulture” is even being considered for a revamp of its feathers having been aired way back at Madstock 96 no less! New song “Bully Boy” appears to have been amongst recent recording work; a new tune first mentioned months back on Dave Robinson’s radio show. Now that Suggs’ solo commitments for this year are complete, early studio work has already taken place alongside rehearsals for their forthcoming Christmas tour and Lucky bag selections. The band have something left up their sleeve for 2018 before the 40th birthday celebrations really begin from January onwards. So, keep your eyes peeled and ears open, as there’s definitely more Madness on its way, and we don’t mean the UK government. And finally, if you’re attending the House of Fun Weekender the full entertainment schedule is now live on the HOF App. Just pay a quick visit to either the Google Play or Apple App Store and you can download it to your device of choice. For the next 10 days to clear out a load of our stock at bargain basement prices (all official Madness merchandise) and save us the hassle of posting, we have created a “Minehead” page on our website for people willing to order in advance and collect from us at the House of Fun weekend. This special page of bargain items will only be open until midnight on Wednesday 28th November. Order as many of each item as you like, once items are sold out we will remove them from the page. The bargains include 30 different official T shirts designs at just £5 each!!! Not even the bootleggers can match such crazy prices! What’s more, buy 10x T shirts and we will give you another 2 of your choice free of charge! Please check out the page for full details, all orders must be placed before midnight on Wednesday 28th November. Those of you going along to the Madness Minehead Weekender, which was due to take place this coming weekend, were going to be in for a real treat as it’d just recently been announced over on the House of Fun page that the band would be playing “The Liberty Of Norton Folgate” in full. So, it was going to be Folgate Friday for all! The album in full would mean the first live airings of Rainbows and Africa. Meanwhile, favourites like Clerkenwell Polka and even That Close had not been heard since the 2010 “Do not Adjust your nut tour”. This week, Suggs tweeted from rehearsals lines from Rainbows, suggesting he was learning the tune. Clearly enjoying himself, he claimed it felt like HIS birthday and was then immediately misunderstood by some with loads of people wishing him happy returns of the day. If they decided to reach into the second disc there were rare songs with many that had never been heard performed live before. Hints of something from disc two at least again came from Twitter with lines from Torrianno being quoted. We had to hope the rehearsals carried on well this week. With the Madness Weekender just around the corner, our MIS Feature took a look at the MIS Presents events taking place from 6:00pm – 10:30pm at Jaks Nightclub on the Sunday of the Minhead weekend. We hoped that it would be a nice place for like-minded Madness fans to meet and have a great time. As we brought this issue of the MIS to bed we pointed out that it looked like plans for the 2014 event were already underway even though we’d yet to get along to this one. How did we come to this conclusion? Well, we’d spotted on the HOF Facebook page that you cold already book for next year. Madness indeed! It may have had a release date as yet, but progress seemed to be racing along with the forthcoming Madness Tribute album. Friends of MIS, M.O.T and JAG, had both recorded tracks for the album. M.O.T with ‘Sign of The Times’, and JAG with ‘You Said’. On to the articles, and we got things underway with the news that bookmakers and journalists were issuing rumours and suggestions of Suggs entering the jungle in the next series of I’m a Celebrity, get me out of here”. Thankfully, five years on and nothing has come to fruition. It was on to graffiti next, as we took a look at one piece that had actually appeared in a background image at this year’s Norton Folgate stageshow. The image appeared during “We Are London”, and was of a wall painted in large white lettering with the phrase “One Nation Under CCTV”. The work was believed to have been created by the notorious Banksy. “Banksy pulled off an audacious stunt to produce what is believed to be his biggest work yet in central London. The secretive graffiti artist managed to erect three storeys of scaffolding behind a security fence despite being watched by a CCTV camera. Next it was over to Fred Beouf who was celebrating one year of running his blog. How was he commemorating this landmark? By issuing 7 treats, starting with a rare French Madness clip. Following this it was back on to graffiti as we went all the way back to 1975, and to a piece of Lee Thompson graffiti which the London Evening Standard were asking “Is this London’s oldest graffiti?”. A number of Madness fans knew that this wasn’t as Lee and Mike’s graffiti in Kentish Town from 1973/74 still survived from their pre band days. Elsewhere we reported on The Dance Brigade’s plans for the year ahead, including the release of an album in the new year. As far as live shows were concerned, the band wanted to concentrate on recording before hitting the venues again. We brought this issue to a close with the news that so far 9 tracks had been recorded and confirmed for inclusion on the forthcoming Madness tribute album. It was certainly starting to take shape. We started off this week’s issue with an important heads-up for those people who bought tickets for the Wembley gig on the 9th of December. So, what as this important announcement? Well, it turned out that the gig for the 9th had been moved from Wembley to The Forum in Kentish Town. Almost as soon as that message went out, The Madness Trading Ring burst into a frenzy of activity. 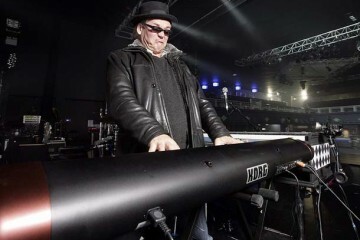 This was initially due to the fact that a number of Madness fans had promised to take their children along to the Wembley gig, and although more than happy to see the band at The Forum, were in a quandary because The Forum was an over 18’s venue. MTR subscriber, Sandy Phillips contacted the venue management to check, and was told that they’d not even considered the possibility of under 18’s wanting to see the show, and were unable, at the present moment in time, to confirm what the age limit was. Elsewhere, and other fans, suspected that the venue change was due to poor ticket sales, which had forced the band’s management to move the concert to the smaller venue of The Forum (which still held a more than respectable 3000+). 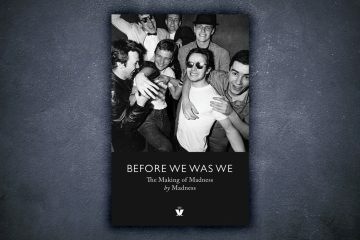 What do mid-70s experimental Liverpool art school Brit-poppers “Deaf School” have to do with Madness? Quite a lot actually! MIS subscriber Darren Balsdon decided it was time to give the rest of us his verdict on the band’s recently released ‘What a Way to End it all – The Anthology’ – a compilation containing 35 tracks plus 11 BBC Peel Sessions versions. Next-up, we had a report from Chris Carter-Pegg and Emma Southerby, who, after learning that a certain Lee Thomson would be making an appearance or two in Oliver, at the Bull and Gate Theatre, Barnet, decided that they needed to get their backsides along and see what the performance was like. “Thommo in the lead role of Fagin certainly stole the show and was excellent, singing in a very different way to his Crunch! / Madness styles of singing, he had very clearly put an enormous amount of work into perfecting the role. It was good to see Thommo’s misses Debbie on stage as well, who also played several parts in the play. 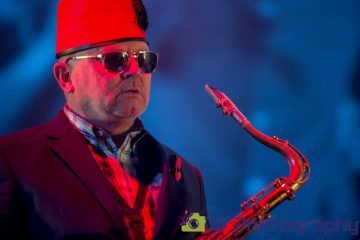 Finally, we finished off the issue with an article from the Three Counties Music section of the BBC web site, where journalist, Katy Lewis, spent time with Ian Soulsby, lead singer of Madness tribute outfit One Step Behind, and asked him just what it’s been like being Suggs for the past ten years. Sunday 11th November and we’re on way to Lee’s Q & A at Sandford Holiday Park as part of the Specialized Big One 7 weekend, a last minute decision to go as it’s not far from where we live. We arrive around 10am and have a look at the auction items that have been donated and quickly decide to put forward our silent bids for a nice set of black & white photos of the band, which are one offs taken by Clare Muller and a nice lot of various Madness T-shirt’s donated by Lee, which includes the rare Baggy Trousers one. We bump into Lee shortly after and have a couple of photos taken with him and have a nice long chat. I ask him if he’s staying over and he replies that he’s meeting a friend in Bournemouth later so will be leaving late afternoon. I quickly reply to him that’s where I live and if he needs a lift I’m more than happy to drive him. I’m not expecting him to say yes, so was pleasantly surprised when he said that would be great! Wow. I Couldn’t believe that we were going to be Driving in my car with Lee from Madness! Still in a state of shock I just looked at my friend Nicky, each of us giggling. The Q & A was excellent and Lee was in great form. A large queue developed afterwards as a £1 donation gave you a photo & signed flyer with Lee, with the donations helping to swell the proceeds raised that weekend. Lee then ushered us into a side room, where it turned out he was doing a radio interview. We listened in silence still not quite believing what was happening. Lee then signed lots of items we had taken with us, including some old MIS fan club photos. OMG, Sorry? What? “Are you being serious?” I ask him. He says he is! I don’t know how I continued driving to Christchurch, but did and Lee popped in to see his friend. I turned round and looked at Nicky! OMG, Lee Thompson is coming round for his tea!!! We just couldn’t believe it!! “Good Lord, why, when?” – just some of the replies we received. Lee gets back into the car and we then drive to my house. We chat about Madness mostly! The new album, classic songs and life on the road. We’re finally at my house. My husband had to go back into work, so there’s just my son at home. I introduce him to Lee, the saxophone player of the band I have loved for nearly 40 years. Nathan doesn’t seem too bothered and chats football with Lee, who doesn’t support a team, I think he got him confused with Suggs, so that conversation didn’t last! We’re now sat at the table eating chicken casserole & mashed potato. I’m looking at Lee, still thinking, this can’t be happening! Please Lee, let me take a photo otherwise no-one will believe us. 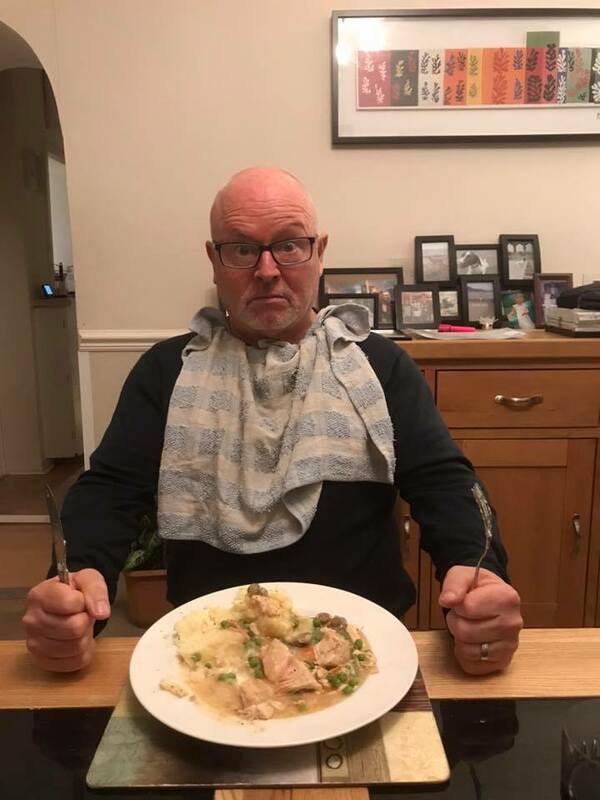 He disappears into the kitchen and comes back with a tea towel and ties it round his neck like a bib. Classic Lee, and a photo that makes me laugh every time I look at it! is taken. The evening ends with a bit more chat and a couple more photos taken with him sat on my sofa. I drive him to Bournemouth train station as he’s booked a ticket for the 9pm train back to London. A completely surreal afternoon and evening, one we’ll never ever forget. Not many people can say that they have had a member of their favourite band in their lounge eating chicken casserole!! 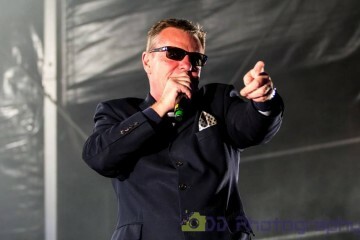 After snow and then fire had twice postponed a visit to Glasgow for Suggs’s second autobiographical show back in March the Madness front man finally made it to Glasgow with this broad comic riff on his life in and out of the band. Taking the idea of the rock and roll raconteur holding forth at the bar and giving it a theatrical makeover, Suggs enthusiastically played the part of an alcohol-fuelled front man getting pie-eyed at Glastonbury, recalling the petty thievery that got Madness up and running and forgetting the first line of Our House while performing in front of a TV audience of billions during the closing ceremony of the 2012 Olympics. All of which came with the odd break into song when appropriate. In some ways the songs were the least of it. Despite the best efforts of his pianist “Deano,” they were often mere music hall singalong punctuation. Fine enough when it’s a tune like House of Fun which always had that in its DNA. But when Suggs ventured into the more thoughtful end of the Madness songbook on One Better Day, the song’s empathy and compassionate observation felt slightly at odds with the beer-burping tone of the stories that surrounded it. That said, by the second half, for all the fun Suggs has at the expense of Bono and Brian May’s hair, a warm welcome sentimentality begins to creep in as he raises a glass to the late, lamented Amy Winehouse and we get to hear more about the singer’s family. Still, it’s a show played primarily for laughs. And Suggs combines adroit physical mugging and a sly facility with language to make the most of comic anecdotes that involve a bag of feline ashes, pigeon excrement and Chelsea football fans. All in all, the theatrical equivalent of that pleasantly woozy feeling you get after two bottles of wine. In 2016 The Simmertones played a packed out show in Jaks at the house of fun weekender. 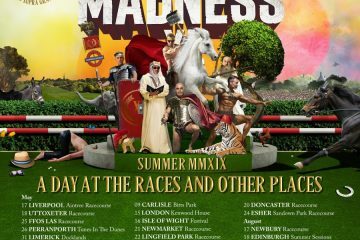 Now they return in support of Madness on the main stage Friday 6pm till 7pm. We begin our series of house of fun act previews this week with a look at the band history and latest news, which has included Radio 2 airplay. The band are frequently played on BBC Radio 2 and BBC 6 Music, particularly by Jo Whiley, Vanessa Feltz and Steve Lamacq, who have playlisted their songs ‘Run For Your Life’, ‘Perhaps, Perhaps, Perhaps’ and ‘Dr Who’. The Winter of 2018 will see the release of an eagerly awaited, brand new studio album entitled ’10 Feet Tall’. The Simmertones’ previous album ‘Something For The Weekend?’ won ‘Best Album’ at the South West Music Awards in 2013. 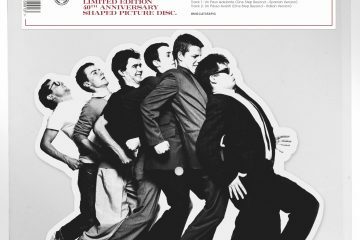 The album received worldwide airplay, as well as rave reviews from Ruby Turner and members of The Specials and Madness. One of the albums’ singles provided The Simmertones with their biggest hit to date, with a release of a cover version of the well-known classic ‘Perhaps, Perhaps, Perhaps’ (which contains samples of ‘Perhaps, Perhaps, Perhaps’ by Doris Day under licence from Sony Music Entertainment. 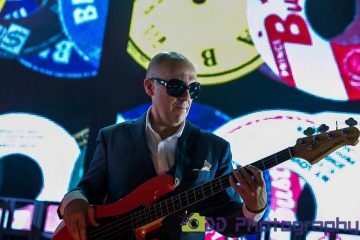 The single was produced by esteemed veteran Richard Digby Smith (Island Records, Bob Marley, Led Zeppelin, Sparks and Free), with the finishing touches applied by Dave Eringa, of Manic Street Preachers fame. These elements combined with an incredible recorded performance by the band, merged to create the authentic sound heard on the finished recording. Other than the incredible Friday night sets played each year by Madness, I have to say The next thing I am most excited about Is the prospect of seeing Tankus playing at HoF this year. More so than any of the other superb acts that have graced the stages of HoF these past 8 years. 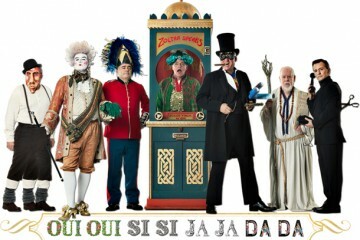 Tankus are Glastonbury regulars, performing there on numerous stages every year. I first discovered them there by chance in 2010, I was an immediate devotee and it came as no surprise when in the follow year’s list of “must see bands at Glastonbury” they were already in the Top 10. Their debut album was released in 2013 and has rarely been out of my CD player. To my ears it’s the best debut album I’ve heard of any band since One Step Beyond. Their long awaited second album “I Crave Affection Baby, But Not When I Drive” is to be released the night before this year’s HoF with a launch party at London’s 100 Club, not surprisingly sold out weeks ago. 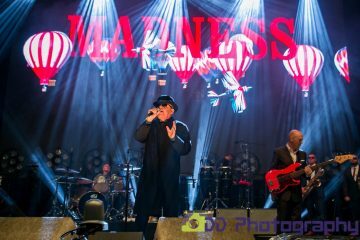 They have been compared to Madness many times, due mainly to their brilliant and largely piano based songwriting and their spectacular live performances. Had they been around in the 80s, I would suspect that they would have already clocked up at least 5x Top 10 hits. Sadly in these days of X Factor and the like they have had to build their reputation the hard way by gigging relentlessly across the UK and Europe to get themselves heard. Their energy on stage has to be seen to be believed. Who are they and what’s their sound? Tankus the Henge are a cult British band based in London, known for their wild showmanship, musical dexterity and a relentless touring schedule. Their funk-fuelled repertoire is wildly eclectic, ranging from New Orleans inspired swing to heavy rock riffs, and since their beginnings in the ratty alleyways of London’s Soho, the band has evolved into a wild groove machine. Their hair-raising show, like no other, has to be seen and heard to be believed. They draw visual and musical influences from old time Fairgrounds to modern day Circus; The Beatles to Tom Waits and Gogol Bordello to Radiohead. Tankus perform on the main Pavilion Stage in a slot before the popular regulars The Inflatables on HoF Saturday at 16.45 (following band at 17.30). Why not watch them both before you run off to change into your superhero costumes! It’s a Marvel-ous double bill of fun. Information on this years MIS Presents events and competitions at The Minehead Weekender. MIS Presents – Out of another world show. Friday 30th from 10pm in Jaks. Owen Collins – Our Poetic resident MIS host returns to compere this years show. this year with us down the regent’s Canal! he’s now appearing for three sets at HOF. Here to mix band exclusive Crunch! Nutty sounds, with pop, Ska and more. Andy “Keys” Clark returns, now with a full band line up of talented ska players from the south west of England, and a raft of Upbeat high tempo original tunes. Andy joined us for our first jaks show in 2013. D.M. Street have been appearing in Cornwall and the south west at festivals and local haunts now for two years. Plus Andy will be DJing tracks from forth coming album Puppet Life at 11.30pm including exclusive spell binding new piano lead tune The Ballad of Gilbert Goode. The arrival of the debut album “Weapon of Choice” is now imminent for this 9 peice regenerational ska band. It’s ready to land and cause the day the earth couldn’t stand still. From danceable “Dutty Mouth” to “Stop don’t listen” Hear it in full. With new tunes such as “Fagan” now being added to an album first previewed in full at The Dublin Castle earlier this year. Their remixed single Dutty Mouth is out now and signed to Animal Farm their debut album is taking a little longer to perfect and release in early 2019. This is going to be packed and sweaty finale to our show this year. Get in early. Launchers T-shirts are available on the official merchandise stand on Friday. Because some girls need a little late night take that and party. Backstreets back alright. After years of asking for the wrong songs at MIS events we relented this year at Reading Specialized, and DJ Mandy Boybandy was let loose to wreck the decks with music we wouldn’t personally touch with a barge pole, but we concede some girls like and want to hear. Boyband tunes from across all the decades. Early bed ska fans. MIS Presents. 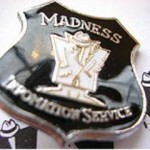 Are giving away a couple of Thommo’s old Madness T-shirts. Crunch! Merch from Swanny. and CD’s from The Launchers & Andy “Keys” Clark (Of D.M Street.) and even A fink brothers T-shirt! If you are attending Jaks Nightclub 10pm Friday Night @ The House of Fun Weekender. Email us OperationMIS@Outlook.com and we will put you in touch with our Puppets on the barrier who will be gifting to some lucky winners on the day. You must then come and meet them at the very start of our show you’ll be pre-registered to meet them. Title your email. Puppet life. We hope to see some of you in Jaks Friday @ HOF from 10pm. (We politely mention to our regular event attenders, I wouldn’t leave it to Midnight if you wish to join us for The Launchers. Jaks holds 10% only of the full capacity of the weekender audience, now we are supporting on a busy prime Madness gig day. I would get in a bit earlier, before the entry queue is likely to start to avoid disappointment, if you are already a Launchers fan from last year’s gig or in general). All hail “Big Bunny.” Saturday morning at this years House of Fun Weekender we celebrate finally the official release this year of 70’s comedy The Goodies in full. While famous for black pudding ecky thump fights & giant kittens up the post office tower… Funky gibbons or kids puppets running the government. It’s only now that some of their wider daft episodes are available for the first time officially, uncut and remastered. In a mood that’s not too far from a nutty Madness video we present their take on “Clockwork Orange” and “Planet of the apes” meets “Buggs Bunny” whilst also screening the shocked mixed dancing Travolta spoofing spectacle of some “Saturday Night Grease.” And a clip from “Lips” their fishiest version of Jaws to get you in the mood for pool fun. Join us in the cinema from Midday Saturday morning. Goodie goodie yum yum. We’ve some DVD’s to give away of Grease, Clockwork Orange, Jaws, The Goodies & another vintage Madness T-shirt from Lee Thompson kept since 1992 their reformation year. This one is the famous brands T-shirt design, much sort after item. These will be prize gifted between episodes. We’re Going to Need a Bigger Boat – Madness Pool Party. – @ Splash waterworld. Come and have a splash to Madness album tracks, Crunch! and more pop sounds and beyond as the MIS DJ this years pool party. Yep Swanny Lake. get it as we complete our third DJ set of the weekender. The Launchers busk section will also be on hand to bring an island vibe to your embarkation to beach holiday fun times. But hey keep an eye out for sharks. BBC Radio Four have commissioned a four part series hosted by Suggs in which the Madness frontman shares a love letter to multicultural London through music, history and comedy. Details on this are scarce at present, but as soon as we have further information we’ll be sure to let you know.